At WAG we believe agility is all about having fun with your dog. But while having fun, we're also training to competition standards so that anyone who wants to, can enter competitions, fully prepared. So if you decide you'd like to try competing, how do you go about it, and what can you expect? The best way to find out and avoid surprises is to participate in a fun show, such as the K-9 Kup team event hosted by the All Dogs Sports Club in North Gower, or to volunteer as a helper at a competition (called a "trial"). But if you decide just to jump right in — and many people do! — here's a basic guide on how to enter a trial and what to expect when you get there. 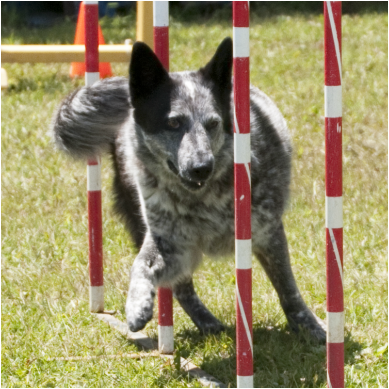 Before you can compete in an Agility Association of Canada (AAC) trial, you must register your dog. It's very easy to do and you only have to register your dog once. He will keep his AAC identification number for life. Registrations is easy. Go to the AAC web site www.aac.ca and click on "Official Forms", then select "Other Forms". Choose "Dog Registration ID Application" and print out the form. Fill it out. Don't worry about the — "Dog's Height at Withers" — just give it your best guess. Your dog will have to be measured at its first couple of trials so his height won't be officially logged until then. Send in your form with your cheque ($12.84) at least 6 weeks before your first trial. When you've selected a specific trial to enter, download the entry form from the host club's web site. Most of the form is straight forward — name of dog, birth date, etc... — but one decision you will have to make is whether you want your dog to compete in the "Regular", "Special" or "Veteran" classes. If you select "Regular", you can always change at your next trial to "Special" or "Veteran", but if you select "Special" you cannot go back to being a "Regular" (although you can change to "Veteran"), so it's an important decision. The difference in the classes lies not in the handling and difficulty of the course, but in the dog's physical abilities. The Regular class is for dogs in good physical shape, with no limitations on their ability. The Special class is for dogs who are not able to compete in the Regular class. For example, large, heavy dogs who put a lot of stress on their joints if they at the Regular jump height might do better in the Special class. Special dogs can jump one level lower than their Regular height, do not have to jump double, spread or broad jumps, and have the A-frame set at 5' instead of the Regular 5'6" height. The Veteran class is for dogs 7 years of age or older (or dogs 5 years of age or older who have been competing in the Special class for at least 12 months). Veteran dogs can jump one level lower than the Special height (so 2 levels lower than Regular), do not have to jump double, spread or broad jumps, have the A-frame set at 5', and are given extra time to run the course (an extra 20%). It's a good idea to ask your instructor for advice on choosing the class. You may select as many of the Starters events as you wish. Most events cost between $12 and $18. Depending on the trial, there may be one or more Standard courses, plus a selection of games — Jumpers, Team, Snooker, Gamblers and Steeplechase (although this latter game is open to Starters dogs, it is set at the Masters level of difficulty). After you have mailed in your entry form with your cheque, you will receive a confirmation that you are entered in the events you chose. The confirmation may not come until a week or two before the trial. Plan to arrive at the trial in plenty of time to set up your chair and shade tent (always a good idea for summer events because there is usually not much shade at the trial venues), take your dog for a walk so he can relieve himself (because if he does anything in the ring he will be eliminated), and have him measured. If you arrive an hour before your first event, you'll have plenty of time to do all this, plus relax! Remember to take with you lots of water for both you and your dog (and a water bowl), as well as lots of treats. There is usually a food vendor at the trial, but not always, so you may want to take food with you as well. A change of socks, rain gear, and a towel are also good ideas. When your event comes up, the judge will call all the competitors into the ring for a briefing. You must leave your dog and your treat bag as well as any food or drinks outside of the ring. You'll need either someone to hold your dog, a crate to put him in, or a tie down (not every venue allows these). After the judge goes over the rules – and this is the time to clarify anything you may be confused about — you will be given 7-10 minutes to walk the course. Again, this is done without your dog. It's best if you walk the course several times. First walk it to see how it flows. Then walk it putting in your specific moves (front cross, back cross, etc...), trying out different ways to handle the difficult parts. Then run it, with your handling moves, at the same speed as you will be running it with your dog. If you have time left over, run it again. Use all the available time. As you leave the course after walking it, check in with the gatekeeper to let her know you're there. Then go walk your dog, play with your dog, watch a few of the other competitors, and generally try to stay relaxed. This is, after all, a fun sport! Two dogs before your turn, you'll be called by the gatekeeper. Go stand by the course entrance, and play with your dog. When the dog running before you is on course, you'll be told exactly when to enter the ring (usually when the previous dog is 3 obstacles before the end of his run). When it's time, you'll go in (make sure you don't have any treats or toys with you), put your dog in his starting position, and take off his collar. When the bell goes, you can start your run. How often the results are announced differs with different venues. Some do it after every event, some wait until several events have been run. Even if you know you haven't won a ribbon, it's good sportsmanship to listen to the results and applaud those who have placed. After the results have been announced, they are posted on a bulletin board so that you can go and check the details of your run (time, faults). Ribbons and Qualifying Scores and Titles are nice, but regardless of what your results are, remember that what you're really looking for is a perfect moment. There is usually a moment in every run where you and your dog will be in perfect harmony — when he reads your body language and listens to your voice and does exactly what you wanted at the exact moment you wanted it. That's perfection. That's pure joy. And that's what agility is all about.